Since they were patented in 1891, Ouija boards have captured the public's imagination and been associated with a number of spirit names. Some of the spirits of the Ouija board are poets, philosophers, and spiritual teachers, some are entirely fictional, and others are believed to be associated with dark or dangerous spirits or entities. Ouija board expert and author Karen A. Dahlman points out that writer and spiritual medium Jane Roberts first channeled the entity called Seth on a Ouija board. "Jane Roberts and her husband Robert Butts started with a Ouija Board to find creative inspiration for Jane's poetry/writing," Dahlman notes. "With the use of the board, they met Seth and after several months... she began automatic writing, which turned into trance channeling of the same entity known as Seth. Many books were written and Seth's material stands at the foundation of the New Age Movement." Seth, through Roberts, taught the principle, "You create your own reality." Roberts' Seth books continue to be popular among spiritual seekers today. In 1913, when Spiritualism was at its peak, it wasn't unusual for housewives to gather and spend an afternoon playing with a Ouija board. Such was the case when Pearl Curran and a friend contacted a spirit that said its name was Patience Worth. "Many moons ago I lived. Again I come. Patience Worth my name," the Ouija board spelled out, thus beginning a years-long channeling. In the beginning Patience Worth, who claimed to have lived in England, channeled poetry and stories. Eventually, Pearl Curran was able to communicate with the spirit without the using the Ouija board. The communication continued until her death in 1937. Patience Worth reportedly channeled six volumes worth of poetry, essays, and short stories - more than 4 million total words. Back before the Mary Tyler Moore Show and Golden Girls, another Betty White was relatively well known for her work as a psychic. According to Dahlman, in 1919, "She was called to the board while at a dinner party by a spirit. She came over, used the board, and then they told her to grab a pencil and paper where she started writing directly from the spirits." The spirits that initially communicated through the board and later in White's trance channeling were called The Invisibles. The spirits taught Betty (and through her, others) how to access higher realms of consciousness and the spirit world. Her husband, author Stewart White, wrote about Betty's communication with The Invisibles in The Betty Book and The Unobstructed Universe. Acquaintences of the Whites, Darby and Joan Finley (which were pseudonyms) also met an entity through a Ouija board. They had met the spirit Stephen several years before they knew the Whites and later wrote a book about him, Our Unseen Guest. Stephen was a British soldier who died in WWI, and he shared his insights about the soul's progression and the afterlife through the Ouija board. Pulitzer Prize-winning poet James Merrill used the Ouija board to write his poetry. Dahlman notes, "He was very open about it, and the entity with whom he worked was named Ephraim, a Greek Jew once in the court of Tiberius." Merrill's The Book of Ephriam is a series of poems from A to Z, all from Ephriam channeled through the Ouija board. Ephriam contributed to many of Merrill's important works including his epic poem, The Changing Light at Sandototver, which chronicles his time spent at the Ouija board and messages from Ephriam's spirit. In recent years, many people using Ouija boards claim to have encountered a spirit attached to the board calling itself Zozo. 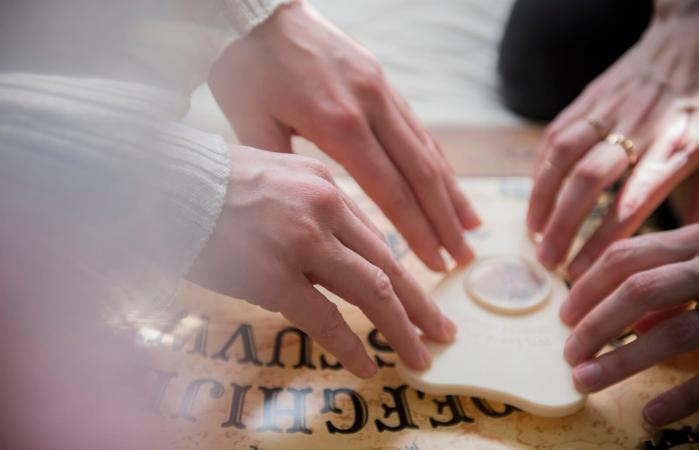 This usually happens after the board has been answering questions for a while when a spirit identifies itself by moving the planchette to the letters Z-O-Z-O. Zozo (or ZoZo) is popularly believed to be a demon associated with the Ouija board. When it appears, people report extremely negative experiences occurring during the session or shortly thereafter. Some believe the Zozo phenomenon is most likely an urban legend causing people to create certain experiences with Ouija boards. Others caution you should immediately end a session if you are contacted by Zozo. According to Dahlman, "Zozo is internet folklore channeled by everyone these days." While many people believe there is an actual spirit named Captain Howdy (also known as the demon Pazuzu) associated with the spirit board, in fact Captain Howdy is fictional. It is the spirit Regan summons on the Ouija board that eventually possesses her in The Exorcist. Whatever your beliefs about ghosts, spirits, and the Ouija board, some compelling stories exist throughout the history of the board. While some believe they have contacted something sinister, others feel the boards have been a source of great beauty and wisdom. How Can I Tell if I'm Psychic?